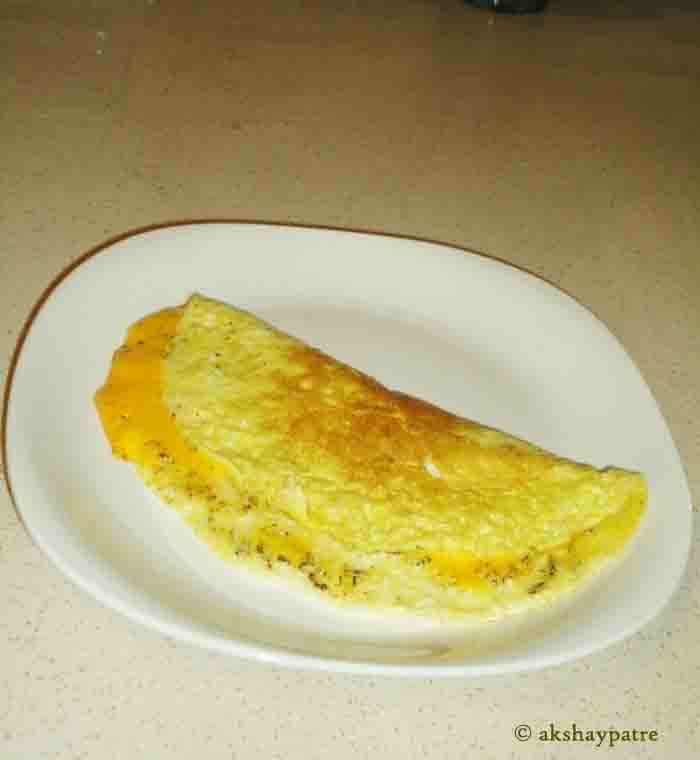 Cheese omelette recipe - A very delicious omelette prepared by using eggs, cheddar cheese slices and pepper powder. This is one of the easiest egg dishes to prepare and is a popular cuisine of the world. 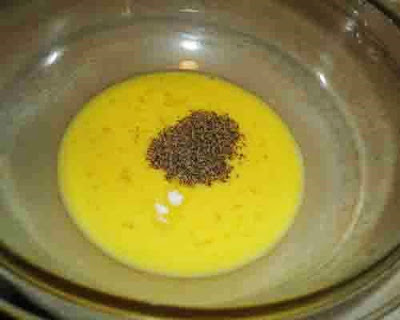 Using eggs in various dishes is very common to non-vegetarians. 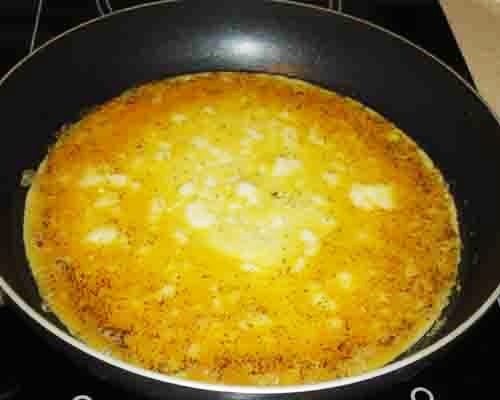 Omelette is a hassle free dish which can be cooked in few minutes. This omelette pairs well with couple of bread slices toasted in butter. Most of the time I like to make onion omelette with green chillies and fresh corianders. I make it often, but both the versions are my family's favorite. Eggs and cheese combination tastes great and this can be prepared with only few ingredients, if you don't like a long list of ingredients. Making pepper powder in a dry mixer jar is very easy, and can be stored for a long time to use in such dishes as and when required. I always like eggs because it makes life easier in the kitchen. 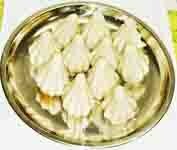 This is one of the egg dishes which I always prepare when we need urgent snacks either for breakfast or in the evening. Though I have used cheddar cheese slices in this recipe, you can substitute it with any other cheese like mozzarella, amul cheese slices and grated cheese. 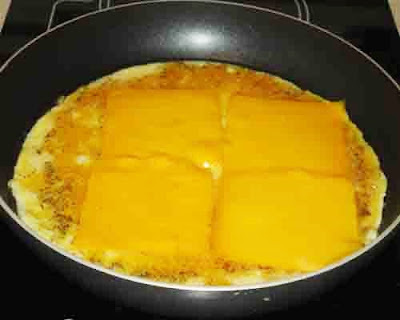 While making cheese omelette cook it till the base and surface become firm, then place the cheese slices and cook till the cheese melts. 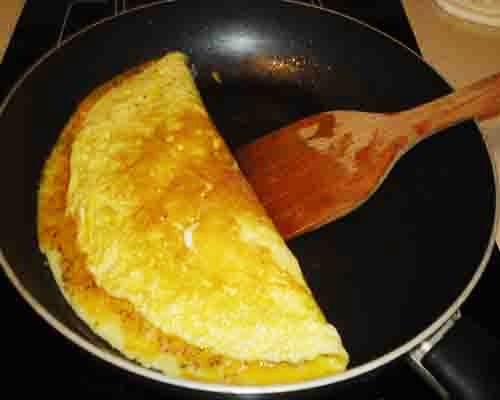 Once the cheese melts immediately fold the omelette and cook on low flame for a couple of minutes and switch of the heat. Cheese become chewy if it is overcooked. 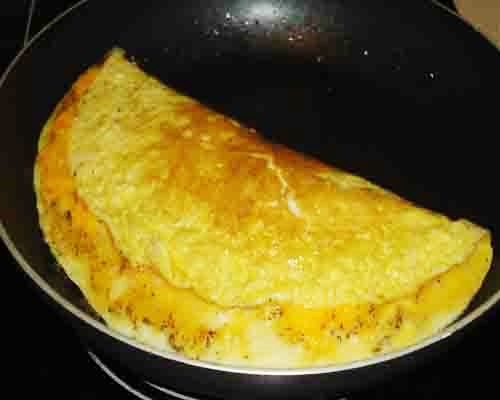 Here is the quick fix cheese omelette recipe for those who like to eat eggs in the form of omelette regularly. 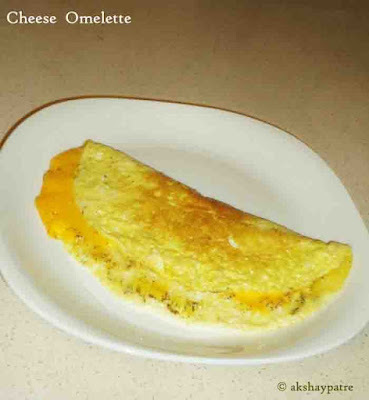 Very delicious cheese omelette which can be served as a breakfast snack along with toasted bread slices. Break the eggs and transfer the egg white and yolk to a large bowl. Beat till the yolk combine with the egg whites. Add the pepper powder and salt. Mix well. Heat a pan and apply sufficient oil on it. Pour the above prepared mixture in the pan. Cook on medium flame till the surface settles and base becomes firm. Place cheese slices on the omelette and cook till the cheese melts. Once the cheese starts melting, fold in the middle and flip. Cook for another 2 minutes on a low flame from both sides. Serve cheese omelette hot with toasted bread slices. 1. Beat the egg white and yolk very well. Add the pepper powder and salt. 2. Mix till the eggs, pepper and salt combine well. 3. Heat a pan and apply sufficient oil on it. 4. 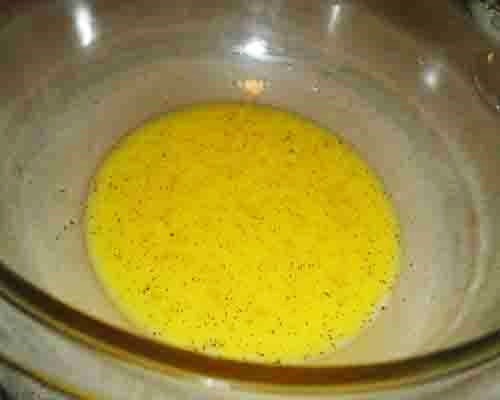 Pour the egg mixture and cook on medium flame till the base and surface of the omelette becomes firm. 5. Then place cheese slices and cook on low flame till the cheese melts. 6. Once the cheese melts, fold the omelette. 7. Flip and cook on low flame for a couple of minutes from both sides. 8. Transfer to a serving plate. It goes well with toasted bread slices. Lovely omlette. very interesting....can i mix cheese with egg mixture? Thank you Sukeerthi, don't add cheese in the egg mixture. Cheese becomes chewy when it is over cooked.